For 70 years, a B-29 Superfortress bomber has rested peacefully in 100-plus-feet-deep water in Lake Mead. With the exception of a few visits by research team members and qualified divers, the plane has remained unseen by the public. Now, on the anniversary of its fateful crash, Lake Mead National Recreation Area is presenting a special program to tell the plane’s history, changes that have been observed since its discovery 20 years ago and what is being done to preserve it. The B-29 Superfortress left Naval Air Weapons Station China Lake in California on July 21, 1948, with a secret ballistic-missile guidance system known as Sun Tracker to conduct high-altitude atmospheric tests. The device would allow a missile to get its elevation and orientation from sighting the sun, improving guidance systems. After flying over the Grand Canyon to complete the high atmospheric tests, they flew over Lake Mead to collect data on low altitudes. According to Vanover, the chief scientist told the pilot to fly as low as possible over the lake, which was “like glass.” She said he couldn’t properly gauge his altitude and hit the lake, skidding about 1½ miles and losing three engines before it sank. Fortunately, the entire five-man crew was able to escape. Because of interest in the plane, the program will be presented twice, once at 10 a.m. and again at 2 p.m., Saturday at the Alan Bible Visitor Center, Vanover said. 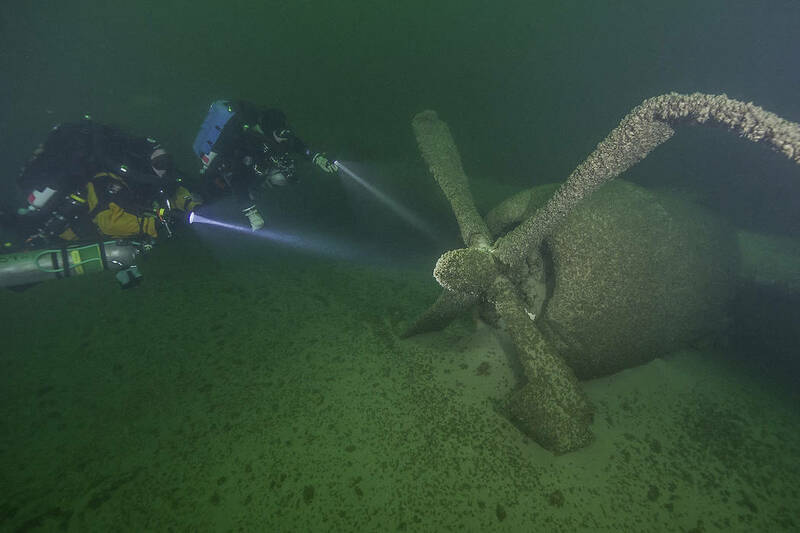 One of the program’s highlights will be the presentation of a 10-minute film that tells the story of the bomber’s crash into the lake and features underwater footage of the plane. Vanover said the program also will include a panel discussion with experts on aviation, history and the park, and the opportunity to view some of the artifacts that have been recovered from the sunken plane, including oxygen tank cylinders and fragments from the aircraft and windshield. Additionally, there will be special junior ranger underwater explorer activities for children and the chance to earn a badge. Scheduled to participate in the panel discussion are Dr. Daniel Bubb of the Honors College at the University of Nevada, Las Vegas, who will present a view of aviation and military history from 1948; Dr. David Conlin, chief of the National Park Service Submerged Resource Center; Susan Edwards, a research archaeologist and historian from the Desert Research Institute; and Mark Hnat, acting chief ranger of Lake Mead National Recreation Area. Also expected to be on hand are a park biologist and diving expert, as well as an aviation expert from the Desert Research Institute. Although permits have been issued to visit the sunken plane, dives are currently not permitted as the Park Service assesses its condition. “As a national park, we’re here to preserve natural and cultural resources,” Vanover said, adding they are in the process of nominating the crash site as a national historic landmark. Space is limited, and reservations for either program are required. Call Vanover at 702-293-8691 for reservations. The visitor center is at 10 Lakeshore Road.